Sony has revealed that a new Uncharted title is coming to the PS Vita this December. 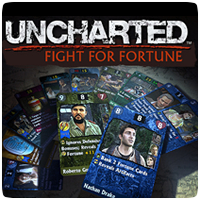 Uncharted: Fight for Fortune is an action-adventure turn-based card game featuring the heroes and villains from the Uncharted universe, and was leaked last week. The core gameplay involves creating a team of Faction cards featuring heroes, villains, and mercenaries and then using that team to defeat your opponent while defending yourself from their attacks. Each Faction card can be equipped with powerful Resource and valuable Fortune cards, which enhance their stats and give them special abilities. Once you’ve selected and equipped a card, it’s time to head into battle. During combat, attacks either reduce the health of opposing Faction cards or the health of your opponent. Defeating an opposing Faction card removes it from play, while reducing the health of your opponent to zero wins you the game. Uncharted: Fight For Fortune is launching December 4 for $4.99 on PS Vita.